Day nine in Costa Rica, we were tired from a long day of snorkeling the day before, so we hung around the hotel till afternoon and then headed to Cabano for more souvenirs. We stopped at an amazing smelling bakery to buy strawberry pastries. We filled the rental car with gas at one of the service stations. The gas is not self serve anywhere, so we paid the attendant to fill up the tank. We paid $36 for half a tank of gas by the liter. We returned the rental car at Budget in Tambor and headed back to the hotel for a nap. At $65 per day, the rental car was by far our most expensive purchase, even more than the room. On the way back, in the trees across the street we saw our first two monkies. They were about 50 feet up and looked about the size of cats but with longer tails. Dinner was delicious as always. 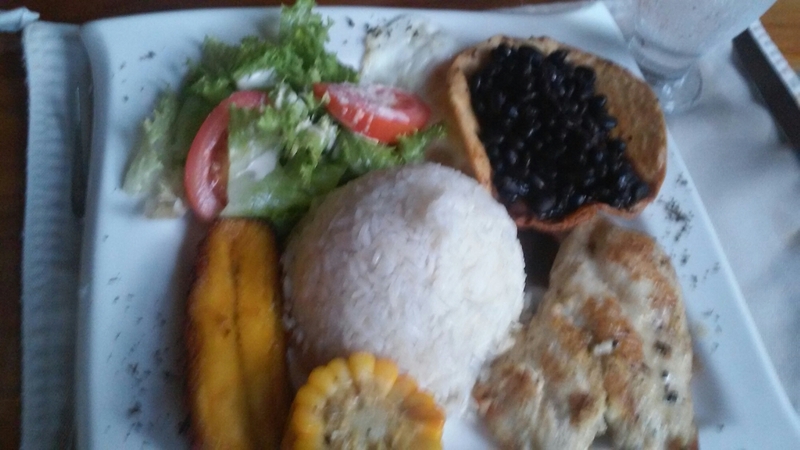 I ordered casado with fish, rice, beans, salad, corn, and fried plantains. You know you’re on vacation when eating and sleeping are on the top of the agenda. By Gina Decker in Travel on May 29, 2014 . Ah, yes…sleep is good when you’re on the go!